i almost wish i were into needlepoint because i would definitely jump on this! as it is now, i have my hands full with working on my own projects but for those so inclined, this a sweet needlepoint kit created by emily peacock tapestry. ms. peacock (i love saying that!) is a former graphic designer who decided to turn her talents and love of tapestry into these nifty little kits that include the canvas, woolen threads, color charts and instructions. you will have to provide the backing, insert and pompoms but that’s the easy part. my head spins to think of how long one of these would take and i’d be lying if i wasn’t considering hiring someone to do it for me! 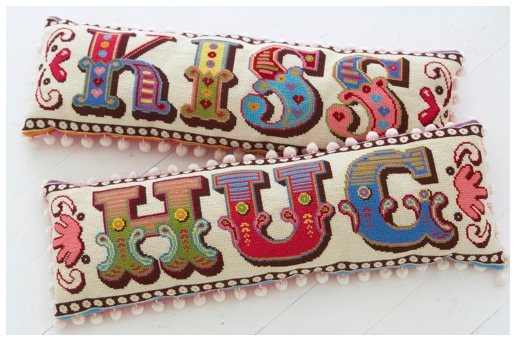 still, if cross stitching is your thing, then what better undertaking than a handcrafted kiss? Super cute! I forwarded this site to my mom, who is REALLY good at this stuff.